In 2014, we took a few trips with my parents to places like Puerto Rico, Disney World, and Las Vegas. 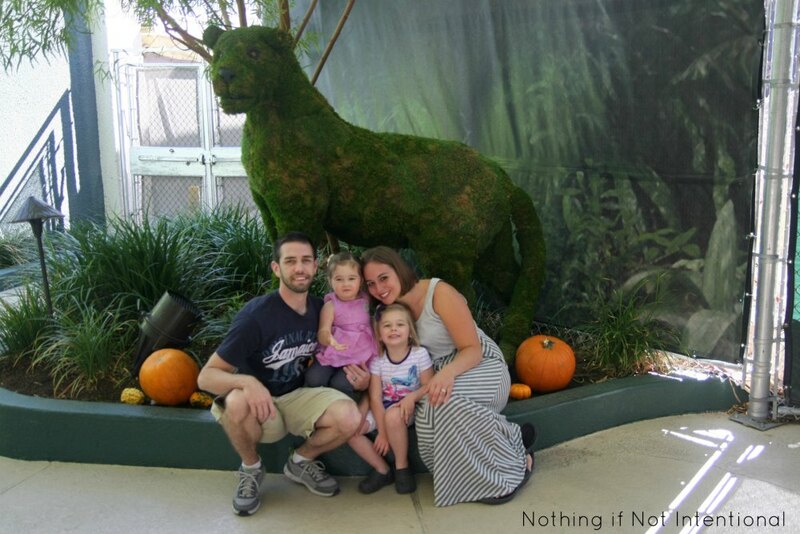 While Vegas might not be the first place to come to mind when thinking about kid-friendly vacation destinations, it’s great for multi-generational travel (my twenty-something brother came too).Vegas is a busy city, and there are plenty of things to do in Vegas with kids! In fact, I didn’t gamble or drink AT ALL! Okay, so that’s not entirely true. I did win and lose two dollars and a random slot machine on the way back from watching Chris Angel (the magician), but that hardly counts. For the most part, we were with the kids doing kid-friendly things! 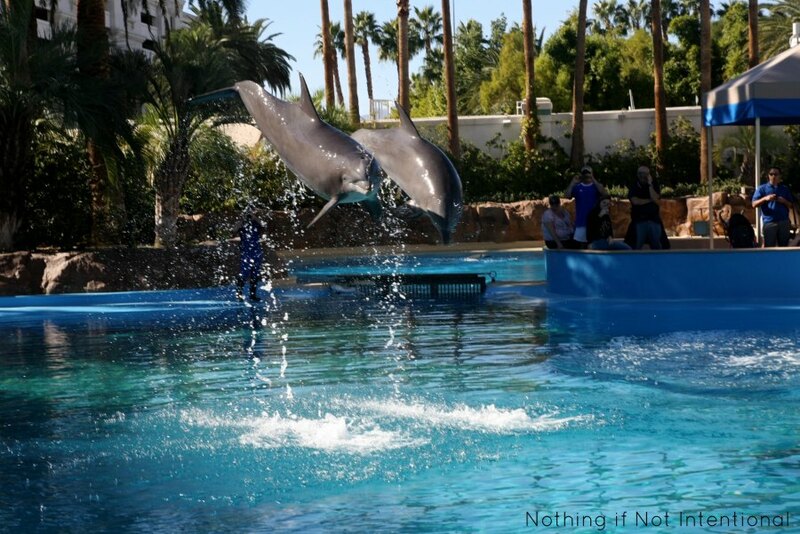 The Dolphin Habitat is an intimate space that gives you the chance to get up close and personal with the dolphins. At different points throughout the day, you can watch a training session. 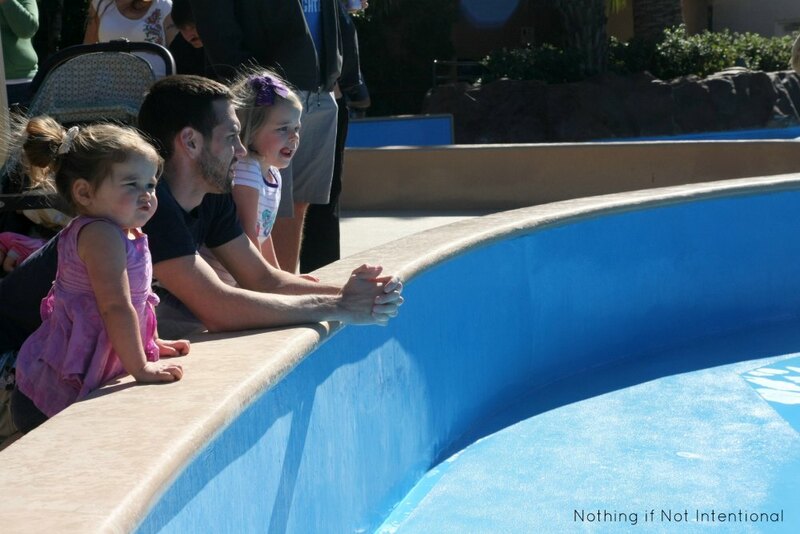 Our girls stood at the edge of the pool and watched in fascination. A few feet away from us the dolphins jumped, played, and hopped up on the shallow ledge to “talk” with their trainers and accept their treats. While the dolphins entertained us, the trainers explained a bit about the dolphins. Did you know dolphins are mammals? This was our preschoolers first introduction to the concept of “mammals.” What a fun way to learn! Unschooling/roadschooling wins again. On the other side of the habitat, you can see the famous big cats. 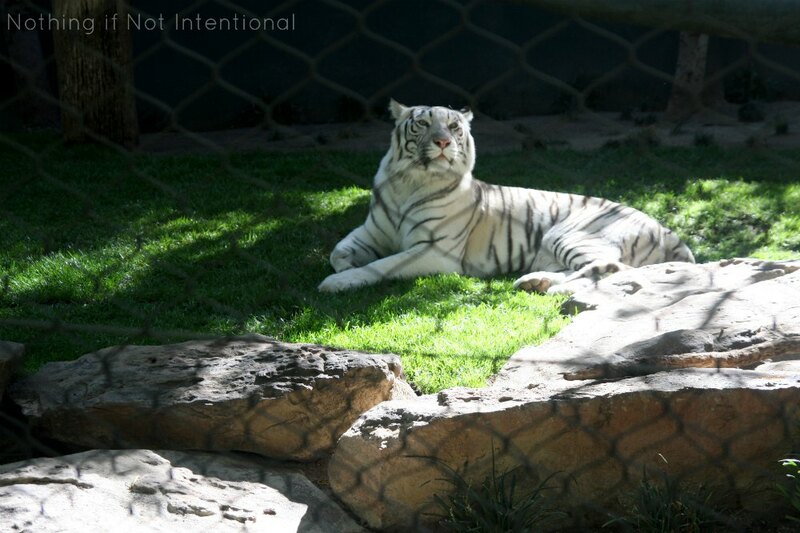 Siegfried and Roy created this oasis as a way to protect the animals they love. I overheard another visitor asking one of the tiger trainers how he felt about the fact that the animals were in captivity. Is a faux-jungle and a big swimming pool really the best place for these creatures? It’s certainly a controversial question, but the staff member answered well. He said that there are 800 orcas, whales, and dolphins studied, cared for, and protected in U.S. captivity. This number is incredibly small compared to the 100,000 dolphins that are killed each year in the wild. .
As for the cats, it’s all about the poachers. Fences, wires, and “protected” areas in Africa have been unable to stop the poachers from killing off these animals. Inside the Secret Garden, the trainers are completely hands-on with the animals. 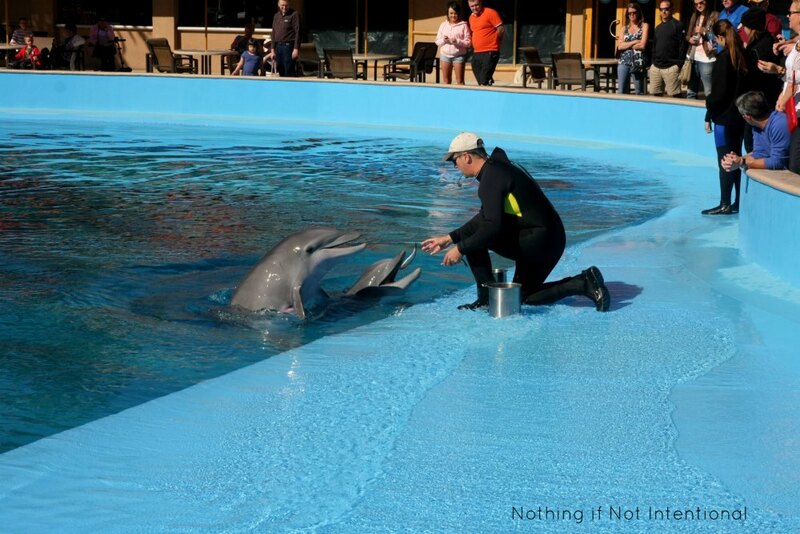 They have sprinklers and canes to use if necessary, but mostly the animals and their human trainers interact freely. Did you know that cubs are blind at birth and that leopard spots are as unique and personal as our fingerprints? These are a few of the fun tidbits we took away from our visit. That, and a few great memories. 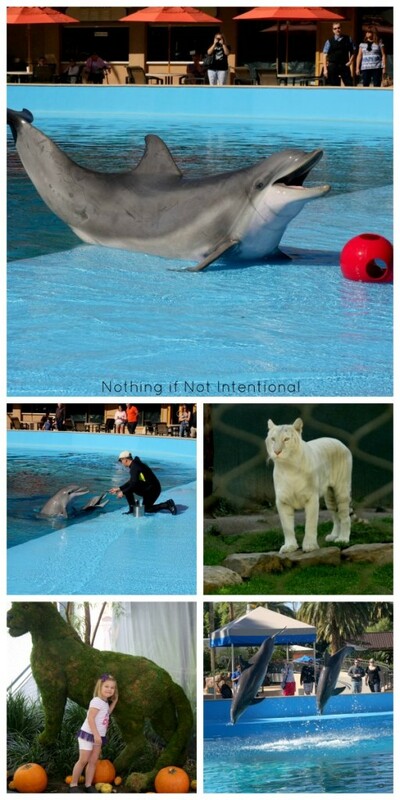 What are your thoughts on visiting animals in captivity? Feel free to weigh in on the Nothing if Not Intentional facebook page! *We happily accepted comped tickets in exchange for our review. However, our opinion cannot be purchased. 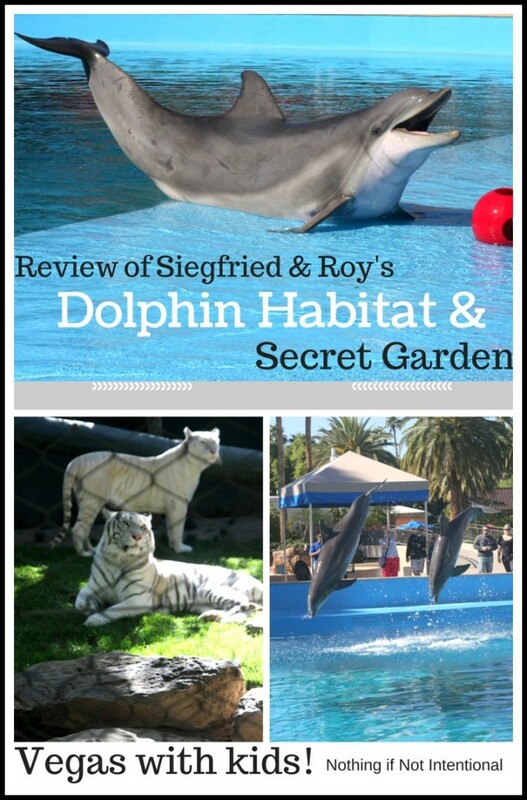 The positive review of the Secret Garden and Dolphin Habitat is entirely our own! ← Best Banana Oatmeal Muffins for Kids. You’ll Love The Ingredient List!